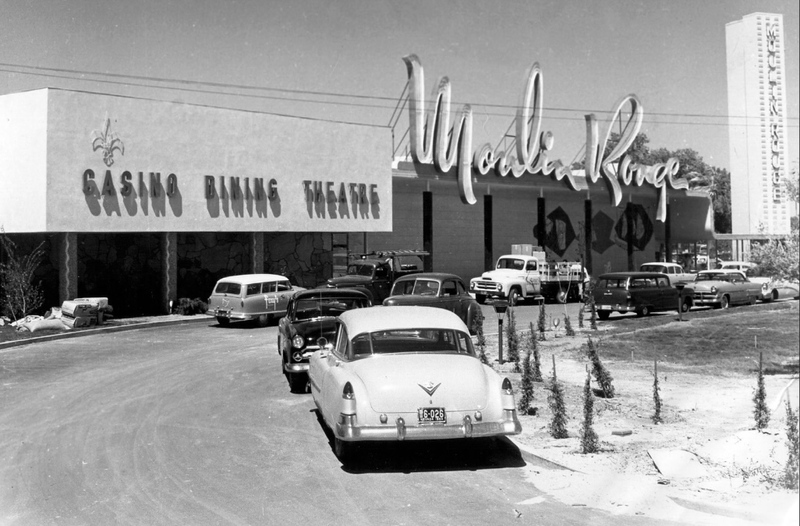 The Moulin Rouge opened on May 24, 1955, the first racially integrated casino in Las Vegas. Vegas at that time was known as the “Mississippi of the West” because of its virulent and persistent segregation. Major African-American stars were touted on the Strip marquees, but none of them were allowed to stay in the hotels or play in the casinos where they performed. The Moulin Rouge was integrated at every level — guest, performer, employee — and featured top notch stars like Louis Armstrong, Joe Louis, Nat King Cole, Jack Benny, Frank Sinatra and Sammy Davis, Jr.
Its stylized cursive neon sign was designed by Betty Willis, creator of the iconic “Welcome to Las Vegas” sign. 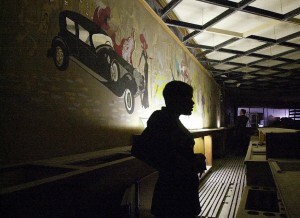 The exterior walls had murals of dancing couples and hot cars, the interior walls murals of Can Can girls and Duesenbergs. 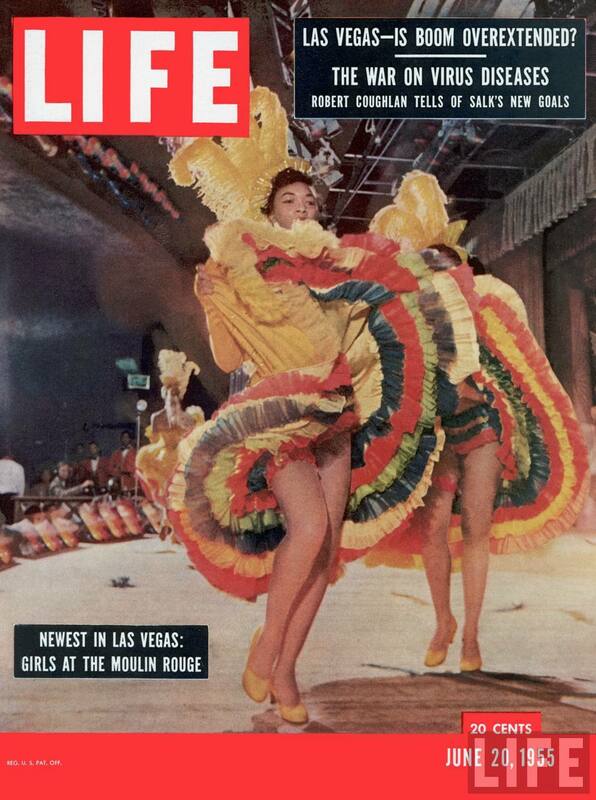 Moulin Rouge dancers even made the June 1955 cover of LIFE magazine. Despite its auspicious beginnings, the Moulin Rouge didn’t even last a year. By November of 1955, it was closed. By December, its owners filed for bankruptcy. It had one more bright shining moment when in March of 1960 casino owners and state and city officials met at the Moulin Rouge with the president of the NAACP James McMillan to forestall a planned protest march down the Strip. At this meeting the parties struck an agreement to desegregate Las Vegas. So the Moulin Rouge is the Civil Rights icon of the city. That notwithstanding, nobody has ever been able to bring it back to life. The West Vegas neighborhood declined, and although the hotel rooms in the tower were converted to apartments and some crappy renovations were made in the 1970s, all the revitalization plans over the decades (and there have been many) have failed to come to fruition. In 2003, an arsonist set a fire that gutted the structure, leaving only the facade and sign. In February of last year, the Moulin Rouge complex was declared a public nuisance and slated for demolition. Just in case that wasn’t definite enough, in May it was hit by yet another fire. Thankfully the Betty Willis sign had been removed just a week before then for storage in Vegas’ famous Neon Museum boneyard. Now, the final death knell has rung. On Thursday the Moulin Rouge tower was demolished. It put up a fight, though. The white tower of the Moulin Rouge hotel-casino, which opened in 1955 and played host to headliners including Sammy Davis Jr., Nat “King” Cole and Frank Sinatra, was pulled down by cables after initial attempts failed and the structure resisted. Hershwitzky said she planned to ask city officials and site owners Olympic Coast Investment Inc. to save as much of what’s left of the site as possible. She said her group would try to find a new place to house the casino’s remaining artifacts.